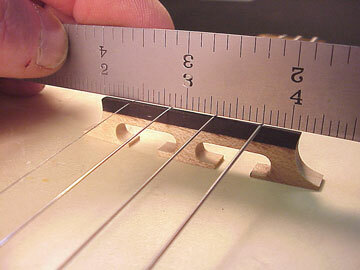 Most banjo players have noticed the tendency of regular banjo bridges to sag as they are pressed downward into the head. Particularly on those on banjos with lower head tension, such as the old timers with skin heads, bridges can sag to the point where playability is impaired. Here's the easy way to avoid the problem. 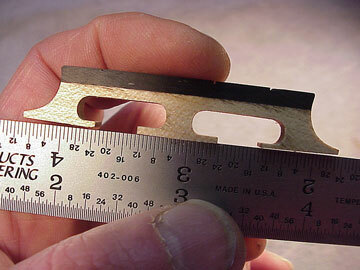 Just lay a piece of fine sandpaper on a flat surface and hold the bridge at the end, and rub the foot to sand off about 1/32"
It's not necessary to be too precise to gain a really good effect. Sure, the net effect of sanding the feet is to lower the bridge a trifle. You might find that it doesn't affect the action too much, though, because the center strings are held at about the same height as the original. You might, however, have to consider a slight coordinating rod adjustment or start with a slightly higher bridge. 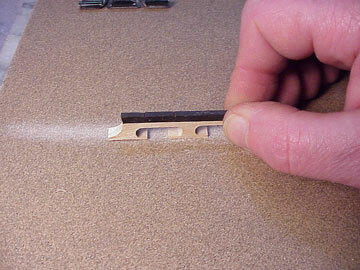 Another simple approach to the sagging bridge is to glue a thin shim onto the middle foot of the bridge.